Physicists at the University of Groningen led by Professor of Functional Nanomaterials Beatriz Noheda have discovered a new manganese compound that is produced by tension in the crystal structure of terbium manganese oxide. The technique they used to create this new material could open the way to new nanoscale circuits. Their findings were published on 20 November 2014 in the journal Nature. The researchers grew a very thin layer (no more than a few dozen atoms thick) of the terbium manganese oxide crystal on a thicker base layer of strontium titanium oxide. This base layer affects the growth of the thin layer. When pieces of growing crystal meet, an interface or 'domain wall' develops, and the crystal structure comes under tensile stress in this wall. Until a few years ago, materials scientists when creating very thin layers tried to prevent domain walls from occurring because of this tensile stress. 'Domain walls were seen as contamination', says Noheda. Then it became clear that the tension in the crystal structure actually invested the material with new properties, and, as has now become apparent, the domain wall can become a nanoscale chemical reactor. The Groningen researchers have gained a lot of expertise in controlling how many domain walls develop. The composition of the base layer affects this, for instance, and the thinner the crystal layer, the greater the number of walls that occur. 'Alongside controlling how many walls develop, a further considerable challenge was to analyse exactly what happens in a wall, as this is generally only one atom thick', says Noheda. One way to analyse the material in the wall is to compare samples comprising different numbers of walls. The researchers saw that the more walls there were, the more magnetic the material was. 'Direct observation of a magnetic field is not yet possible on the atomic scale, particularly not in an isolator', says Noheda. An advanced atomic-resolution chemical analysis was used to show that the composition of the crystal in the walls had changed: in specific locations a manganese atom had taken the place of a larger terbium atom. 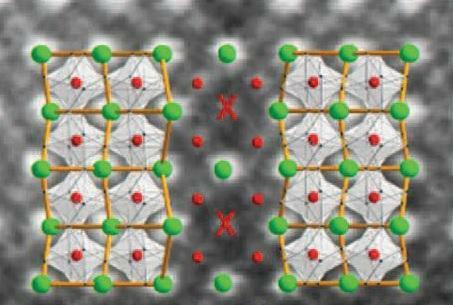 The terbium atom forms a kind of zigzag line in the crystal structure. Two opposing zigzags meet in the domain wall, thus causing some of the terbium atoms to come into very close proximity. 'This creates significant tension, the terbium atom disappears from the crystal, and a smaller manganese atom takes its place', explains Noheda. Beatriz Noheda and Maxim Mostovoy both work at the Zernike Institute for Advanced Materials (ZIAM), part of the University of Groningen's Faculty of Mathematics and Natural Sciences. The ZIAM is a top national research institute. Noheda's research is funded by NanoNextNl, a consortium of 130 partners including universities, members of the business community and the authorities who collaborate in the field of microtechnology and nanotechnology, and by FOM, the Foundation for Fundamental Research on Matter.